Yesterday a thought came across my mind as I was reflecting on some hard times I had gone through in life, when all of a sudden, I could see these pieces of time that were connected to my heart drawing themselves together. It was as if a fingertip was forming them into a beautiful masterpiece. These broken fragments were laying about as if on a tabletop. Although, I could only see these images that appeared like puzzle pieces of broken time frames, I could tell they were the fragments from my life’s journey, and I struggled not to allow them space to tug at my heart. Nothing else was visible, the only color in this vision came from these images that took up a small area of space; no bigger than the mosaic table I had purchased. Last month I had purchased a beautiful plant stand to use in my studio as a small table for when I due procedures. This stand would hold the tools I use to do facial treatments and to draw permanent makeup on clients. Each time I dip my hand tool into the pigment, setting on this beautiful mosaic table, I feel this peaceful, pleasing feeling, and I notice a flow of energy allowing this creative action to take place through my fingertips. There were a few times I was going to take this plant stand back thinking I needed something taller, not recognizing it’s true meaning and value. With each thought to return it came another thought from something bigger inside me saying, “Hang on!” Now I have learned why…. Here I am almost a month later and the value of this beautiful mosaic table has shown it’s true meaning. 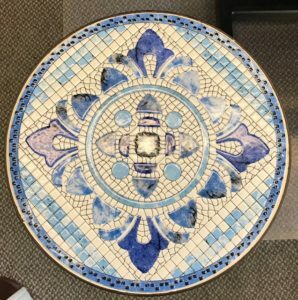 Who would have known that this beautiful mosaic table purchased at Hobby Lobby for only $24.99 would bring such a significant value into helping me work through some pains from my past. With God as my potter, and me as the clay; his hands shape the pieces of the good and the bad, my successes and my failures, my pains and my joys, along with the light and dark days. As it’s all spread out before him, he designs a beautifully orchestrated pattern. Although, I could not see the pattern in it’s finished form because life is still flowing through me, my eyes began to swell and my heart became full. I knew that the one who looks over me, the one who never fails, the one who remains faithful and trustworthy; once again, has shown me the way through an uncertain time with his deep love for me! All of us have a talent but unfortunately some of us have not discovered it yet. My hope is to lead you to the “Super Power,” within yourself, that can lead you to living the life you love living. When we focus on what it is that we love, we find an internal energy that we didn’t realize we had. I want you to understand this truth, wherever you place your time and energy; it will grow! Therefore, if you focus your time and energy on what you are lacking you will experience more lack. If you focus your time and energy on something that you love doing, something that makes you feel alive and gives you a sense of purpose; you will watch this grow! So remember this, “If you could do anything in your life, what would you do? What does this life you would love living look like for you?” Would you be a pre-school teacher, a doctor, a writer? What is it you would love to do? The side of you that you give more time and energy to; is the side that will dominate. We have the ability to shift our thinking in order to get a clearer vision of what we want. This system for transformational thinking does work; I have done it! As you wait for a solution, find this part in you that makes you feel confident… leaving you with a thought of thankfulness. Think of the successes in your life. What is it that you can do well, such as: sewing, cooking, painting? When you come up with the answer; spend time doing it. We need to get in this state of gratitude so we can explore and bring to life what makes us FEEL OF PURPOSE, we all need to know that WE MATTER! It is vital for each of us to feel a sense of value, and with this sense of value comes the desire to grow, and build the skills that will help us experience a successful outcome. Each of us have a unique, in-ate ability that, when discovered and utilized, we experience a richer, fuller life.. Through trial and error I have learned, when I keep my hands busy doing good things, good things come from it. Learn to get quiet and listen; the solution is inside of you. Visualize yourself on the other side of your circumstance! Get quiet. Listen. There is a soft voice inside of you trying to get your attention. This is often referred to as a still, small voice. 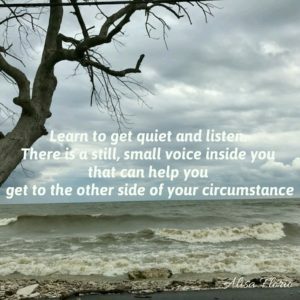 This voice will lead you to discovering what you love and help you find the solution to get to the other side of your circumstances. It is amazing how inspired we become when we have something to cling on to; especially in our tough times. We have a live spirit that lives in us just waiting for us to call out for help. Wanting to be involved in our personal circumstance, and lead us into living a life we love living. Yes, each one of us face fears at times, and when we try escaping these fears and lose the battle, it can keep us stifle; holding us hostage for fear of entering into an unknown territory. We tend to fall into a repetitive lifestyle because this fear fights to win us over. I am not asking you to try to beat this fear out of your thinking process, but, I am asking you to invite your fear to come along with you. I am simply encouraging you to apply these thinking tools from a proven system. Add these tools to your tool belt that leads you to experiencing a more richer, fuller, freeing life. I believe when we make this shift from our limiting beliefs, this is when we really start to come alive. I met Jesus personally while battling cancer. Then life took twists and turns toward divorce, some of my loved ones fighting drug addiction and being diagnosed with cancer, mental illness and other life threatening illnesses; and most recently the loss of people through death, or the ending of some of those not so healthy relationships. I tried so hard to keep all the bad things in the world separate from me and my family, while these bad things were trying to infiltrate my home, and tear our world apart. that started with, I am the same yesterday, today & forever. It took me awhile to learn the value of this relationship and to put it above any other. I had to learn to trust, since trust was not alive in me anymore. He encouraged me to see that I was worth something other than the lies I was beginning to believe. Sometimes we have to become broken so Jesus can help us become strong. Now I wear this coat of armor that only God can hand to us. He comforts us with his grace and showers us with his love. Jesus cleanses the filth from our past and wipes away tears; turning them to joy. Today I live in thankfulness, with a tremendous passion to connect people with Jesus and introduce them to the tools that he has provided to help free our minds from these limiting beliefs the world would like us to believe. In this book, “No More Tears With Jesus,” a love story will unfold on who Jesus really is. If you don’t have a personal relationship with Jesus, I hope this book will lead Him who is the bridge that walks with us to meet our loving Father, helping us enter into an eternal love and life! 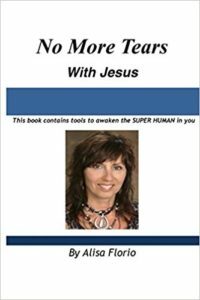 Click Here to purchase “No More Tears With Jesus” today for yourself or a friend. 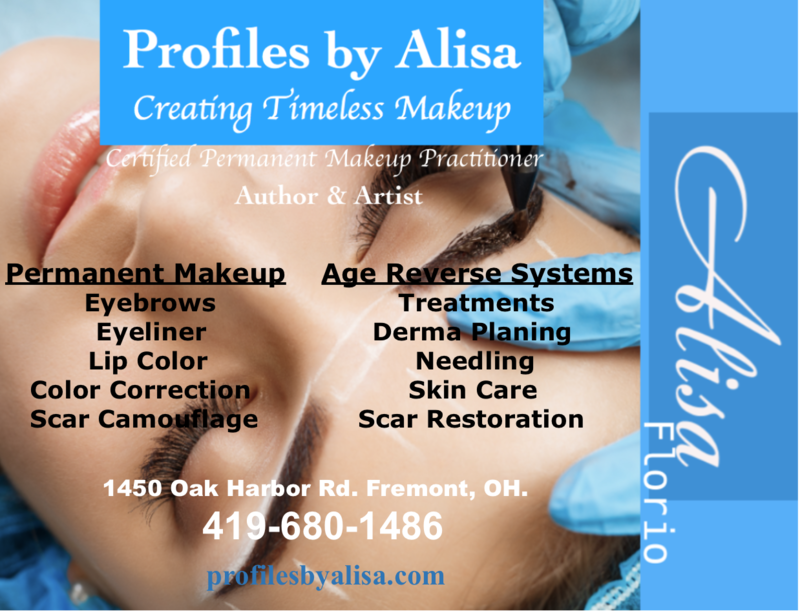 With the sale of each book I do a personal tithe toward helping and serving others! I wish you all the best in life!